Holistic healing relies a lot on targeted supplementation — everything from probiotics, to magnesium, fish oil, Vitamin B-complex, and the nutty sounding ones like ashwagandha or dandelion root. When during the day am I supposed to take all these supplements? Cue, getting even more stressed out. Do I really have to open all these bottles? I'd rather just go to bed. What do I do when I travel? Leave them at home, and then forget about your supplement routine for the next month. Ugh. Been there. Done that. When I started my path to holistic healing — combatting adrenal fatigue and getting my period back naturally for the first time since my teens — I was taking a ton of supplements and my adherence to my program was ehhhh . . . 60%? It felt so overwhelming to remember when to take all my pills and I frankly didn't want to feel like a sick person carrying around a pill case. So, I was thrilled that after many years of on and off again supplement use, my friend Andi from summer camp introduced me to Suzie Welsh. Suzie has a Bachelor of Science (BS) in Nursing and worked in a Fertility IVF Clinic for years. She gets what women need for optimal health and was determined to find a solution to make taking targeted and personalized supplements EASY and effective for women, everywhere. Suzie is the Founder and CEO of Binto, a subscription-based women's health company. If you hop on over to their website, www.mybinto.com, you start by taking a quiz to customize your supplements to your symptoms. 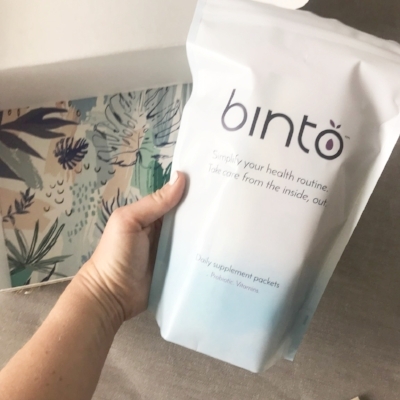 Then, Binto creates a customized suite of products that will be sent directly to your door every month. I'd never tested out this type of supplement subscription model before, and I was super interested to see if this would be a good fit for my health coaching clients, who tend to be on-the-go, busy professionals, and of course, for myself! Suzie and I hopped on the phone to chat and she answered all my questions and more. Read on for my results and why I am the biggest fan of this product. My period cycle went from 36-40 days, to every 28-29 days (the ideal cycle). My nails are growing faster. My digestion is great — no bloating or weird tummy aches. I haven't gotten sick — aka my immunity is strong. Sure, the results are great. But here's what I really love about the Binto model and feel oh-so-comfortable recommending it to my 1-1 clients. Why have countless bottles of almost expired supplements taking up space in your cabinets? Keep it simple, throw out unused or expired products, and use the monthly delivery to literally save space in your kitchen or bathroom. Life is overwhelming enough. We have to make so many choices every day. It can feel exhausting at the end of a long day to remember which supplements you should be taking that night. Stop the mental fatigue and just rely on your personalized kit. Binto understand that every person, every body is different. They personally customize every single kit to be unique to you. If you guys know me, you know that I LOVE personalizing everything. Personalized nutrition, personalized fitness, personalized wellness. Because, it works. Raise your hand if you travel a lot for business or pleasure. Yup, me too. When I worked in Finance, I was on the road 2-3 days a week, and then would often jet off somewhere with my girlfriends most weekends. That's a lot of packing to do! 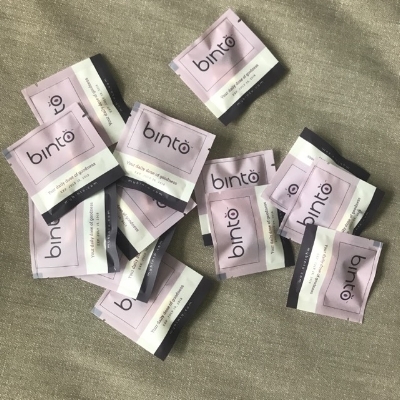 Nowadays, most of my clients are constantly on the go, and I love that they can just throw a few supplement packets in to their bag and make their flight. Suzie and I spoke a lot about quality when we chatted on the phone and I was very impressed by her standards. You know you're getting the best with these products. Which leads right in to pricing. I was suspicious . . . why weren't these super high quality, personalized supplements not like, $100 or $150 a month? Why weren't they more expensive? Because frankly, other companies out there are charging multiples of Binto's pricing. And here's why :: Suzie explained to me that the supplement industry is known for the middle-man taking a huge chunk of the profit and raising the price to consumers. Not Binto. They've purposefully decided to keep the margins low, to benefit the consumer and build a loyal customer base. These packets are truly affordable, for EVERYONE. I'm paying just $35 a month for my kit. And it's getting shipped to my door. That's less expensive than if I went out to the store and bought everything on their own! My favorite part. At the end of the day, I open my cabinet and pull out a little packet and feel like I'm almost, sorta opening a box on a Christmas Advent Calendar. I'm so thrilled and excited I'm on track and I get to open the cute little designer pouch every evening. The process makes me feel proud of myself and what I'm doing for my health — and you can't get much better than that. Just a note: Suzie and her team sent me my first month of product for free. I now personally subscribe to their service ($35/month) and plan to continue indefinitely. I volunteered to write this blog post simply to share with my community and clients. All opinions are truthful and my own.